"Why City Specific Insights Matter for Business Strategy" by Euromonitor mentions that more than 60 percent of the population worldwide will live in urban cities within 13 years. This means urban markets are extremely influential for businesses and brands, making demographic information vital for marketing. “Cities are the engines of economic growth, cultural melting pots and innovation hubs,” Kasparas Adomaitis, cities manager at Euromonitor International. “Urban living is at its highest point ever and is set to increase as 60 percent of the global population will reside in cities by 2030. Luxury business can benefit from investing in markets such as Beijing, Shanghai, Guangzhou and Shenzhen, as the report notes that these Chinese locations are known for high growth, wealth and affluent consumers. Small businesses are likely to fail in these markets due to high real estate prices brought on by an increase in demand. 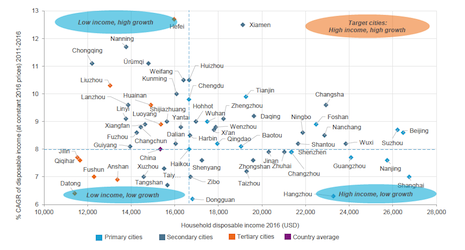 Changsha is home to more affluent consumers than compared to Shenzhen, Tianjin and Wuhan, and disposable income is greater than the country as a whole. Within Europe, Eastern Europe is home to less affluent citizens compared to Western, and luxury brands should look to Germany and the Netherlands as they are home to more wealthy consumers. Only a few cities in Eastern Europe are viable for luxury brands and retailers. In Europe as a whole, Prague, Warsaw and Katowice, Poland; Budapest, Hungary and Bucharest, Romani are the most practical cities for luxury companies to do business in. These cities have the largest numbers of high-income consumers. Cities in Western Europe are showing declines in the number of wealthy households, but Asian urban markets are showing significant growth in disposable income. For instance, Rome saw a 16 percent decrease in disposable incomes per household in constant value terms, compared to Shenzhen, China which saw a 40 percent increase. 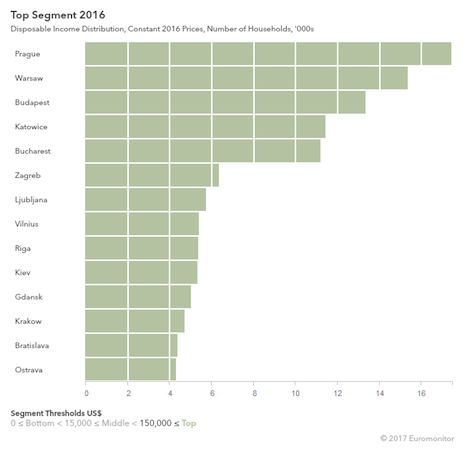 Eastern European cities are seeing population decreases, while Asian, African and Middle Eastern cities are seeing growth. Even though the United Kingdom is undergoing an economic slowdown and complications from Brexit are troubling, the country may see a surprising result in tourism trends. According to a session from Euromonitor International, inbound arrivals in the U.K. may see a 7 million increase by 2021, despite political upheaval. While VisitBritain, the country's tourism bureau, originally estimated there would be 40 million inbound arrivals in 2021, Euromoniter believes that number could be as large as 45 million (see more). Across all regions, luxury ecommerce is growing at a faster rate than total sales, according to a senior analyst from Euromonitor International speaking at Luxury Interactive 2016 on Oct. 19. Speaking on “Divergence in the Digital Landscape,” Ayako Homma noted that while the entire luxury market is expected to see a compound annual growth rate of 2 percent through 2021, luxury online sales are expected to rise at a CAGR of 7 percent in the same timeframe. To capture this growing piece of the luxury pie, brands will need to improve their omnichannel, ecommerce and mobile experiences (see more).